One of the most popular scenes from The Devil Wears Prada is when one of the main characters, Miranda, played by Meryl Streep, explains to one of her uncaring employees as to why fashion is so important–not to her, but to society. In the film she tells this individual that even though she acted as though she had no interest in the fashion industry or in the outfits she wore daily, the fashion industry was responsible for pouring billions of dollars into the economy and providing thousands of people jobs. Moreover, every piece of clothing she wore was custom created by a company due to what someone had considered fashionable. Whether she had considered it or not, she–and everyone she knew–was directly impacted by fashion. Fashion has a lasting impact on everything; from the uniforms worn at fast food restaurants to outfits artist wear on the cover of your favorite album. Fashion touches us every day. Take film, for example. There are many films, which without fashion, would be hard to enjoy. Check out some of my favorite vintage fashion films that without the style of the era would have been less enjoyable to watch. 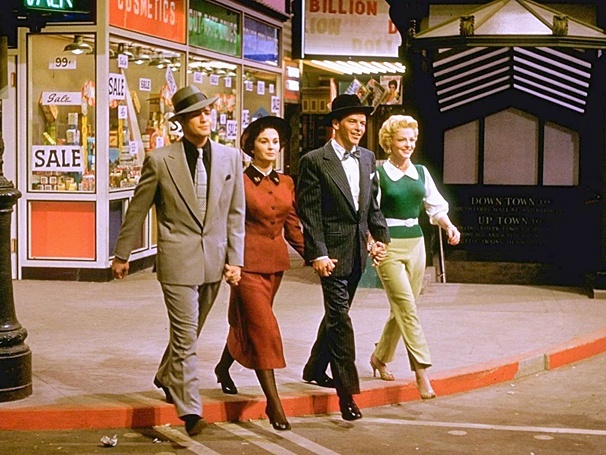 Guys and Dolls, a 1955 movie based on the 1950 Tony Award winning musical, was set during the 1940s. The four main characters, idols of the time, were Marlon Brando, Frank Sinatra, Jean Simmons, and Vivian Blaine. The biggest names in entertainment received only the best in regards to outfits. Set during the 1940s, these unlicensed professional gamblers only wore the best suits and their women dressed in equally high-quality garb. The nice suits, with matching hats, were a sign of the times, and times were good! While both of these leading men were success symbols, starring in dozens of films, it was their attire in Guys and Dolls that everyone remembers. Their vintage fashion will always be solidified in film history. Another great film based on a musical was Funny Face. 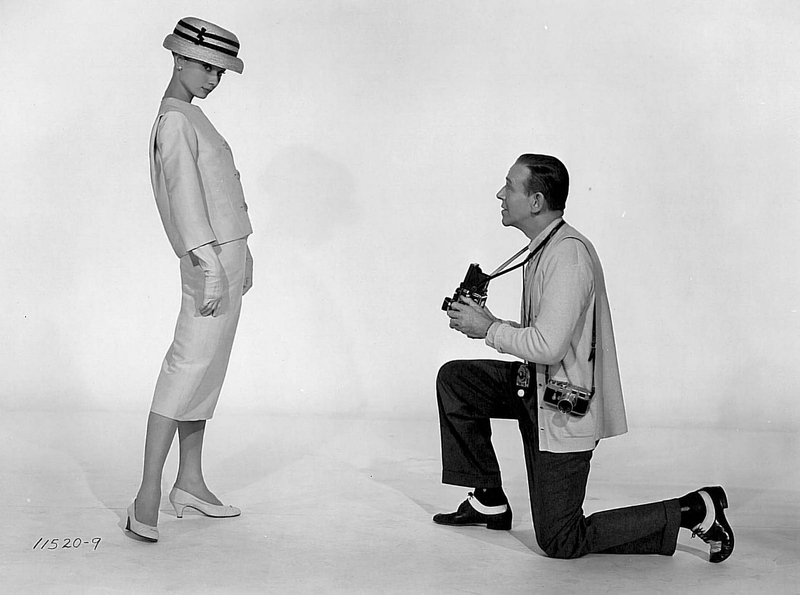 This 1957 film, based on the 1927 Broadway musical with songs arranged by George and Ira Gershwin, stars Audrey Hepburn, Fred Astaire, and Kay Thompson, and was created around a plot built on the fashion industry. Not only were the clothes themselves important to the aesthetic look of the Funny Face, but fashion was central to the storyline. Kay Thompson’s character, based on Vogue editor Diana Vreeland, plucks Audrey Hepburn’s character, Jo Stockton, from obscurity and turns her into a Paris fashion model. Not only did this film give viewers a look into the life of fashion models, but it also provided insight to running a fashion magazine. To this day, the wedding dress that Jo Stockton wore while on the fashion show catwalk that final time in Paris still serves as the dream dress for all brides looking for 1950s era wedding dresses. This dress is the quintessential vintage wedding dress. It’s something about the combination of Broadway musicals and Audrey Hepburn. 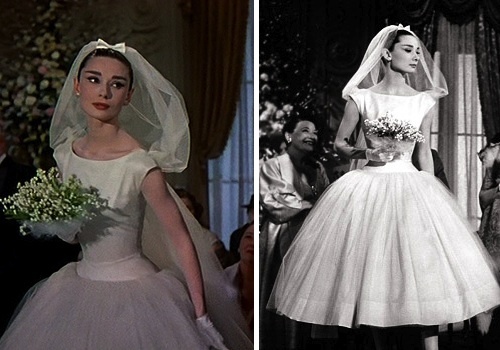 Broadway musicals heavily rely on props and sets to sell a show and Hepburn just has impeccable taste; the meshing of these two created one of the most sought after outfits in film history. Fetching $3.7 million dollars at an auction in 2011, Audrey Hepburn’s Ascot costume from My Fair Lady (a staple of 1950s cinema) is the second most expensive movie costume ever sold. From her dress that covers all exposed parts of her skin to the large hat, this dress is typical vintage fashion that would have been displayed during the annual Royal Ascot in England. Furthermore, this fashion is not only still appropriate, but also very much expected for those that attend the Ascot in this decade. The most anticipated aspect of the Ascot each year is the fashion, and this movie and this outfit have a principle role in the matter. Every woman that has ever watched Casino wants to be Sharon Stone. Whether she is on the casino floor or lounging in her hotel room, Sharon Stone’s character, Ginger McKenna, is always dressed in the finest of designer dresses. Furthermore, she is draped from head to toe in fur coats, solid gold accessories, and the most luxurious of handbags. So far, every movie on this list has been glamorous; Bonnie and Clyde is the exception. 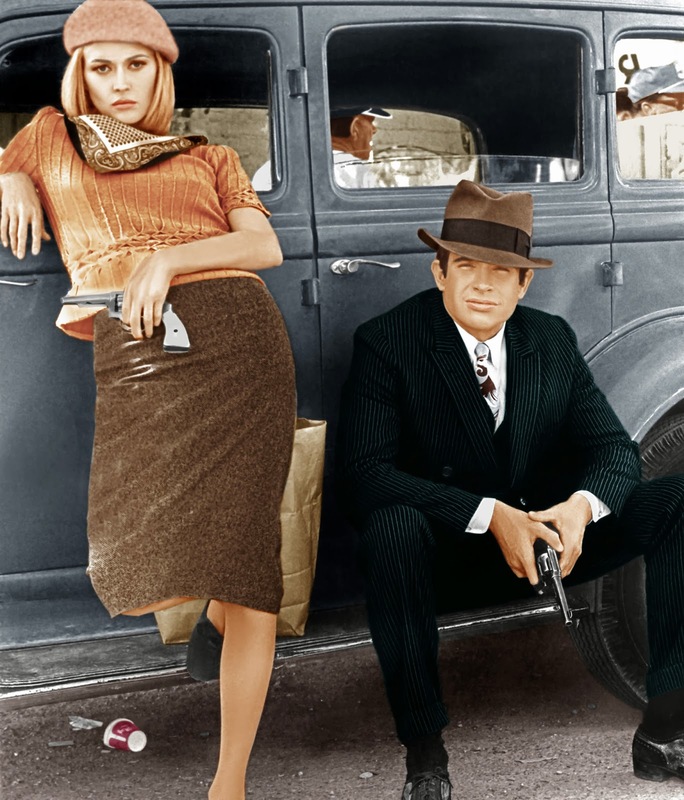 This 1967 film, based on real events from the Great Depression shows the unique fashion that these two individuals had. With the release of this film, a fashion revolution was ignited. All of a sudden, fedoras and double-breasted suits became all the rage for men, and berets and long skirts became popular with women. This movie is arguably one of the most influential films in regards to vintage fashion. Obviously lab coats aren’t trendy, so it isn’t a doctor’s outfit from this movie that serves as vintage fashion. It is an accessory worn by Sylvia Trench, played by Eunice Gayson in this classic James Bond flick that would ignite the comeback of the brooch during the 60s. Falling slowly out of fashion in the 50s, Sylvia’s character played a large part in the revival of the brooch in vintage fashion. It is only fitting that the women playing one of the oldest European casino games is also wearing one of Europe’s oldest styles of decorative jewelry. In this clip below you see Eunice Gayson’s character being beat by Bond in Baccarat. Because Bond kepts getting dealt naturals she loses; however, she looks great doing so, wearing a classic vintage dress with that fantastic brooch. In the 2006 adaptation of Lauren Weisberger’s 2003 novel, Anne Hathaway plays Andrea Sachs, a journalist looking to make her mark on the world. She receives a job working for Runway Magazine under a hard-nosed, no-nonsense boss. A self-proclaimed “anti-fashion” individual, Andrea quickly comes to terms with the fashion industry as it is both necessary for life and for her career. While this movie wasn’t filled with a lot of vintage fashion, I see it as a foreshadowing film for further generations. Not crazy about the first 3 outfits but that green leopard trim coat is to die for! What many people don’t realize about this movie is that fifty years from now, it will be on everyone’s list of vintage fashion in movies. The wardrobe for this movie has been described as the “most coveted, up-to-the-second wardrobe of any film,” and was the most expensively costumed film in history, with a wardrobe valued at over $1 million. Certainly have enjoyed the fashions in “Guys & Dolls” many times and looked for tips and ideas. Likewise with “Carmen Jones” which is even better. The first Casino photo looks like every dress J Lo has ever worn on the red carpet. Cómo disfrutar de la moda desde nuestra casa. Came across this today – LOVE IT! 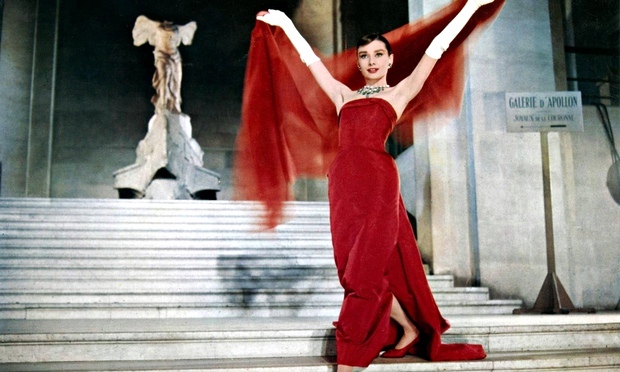 Especially “Funny Face” – one of my fave fashion films.